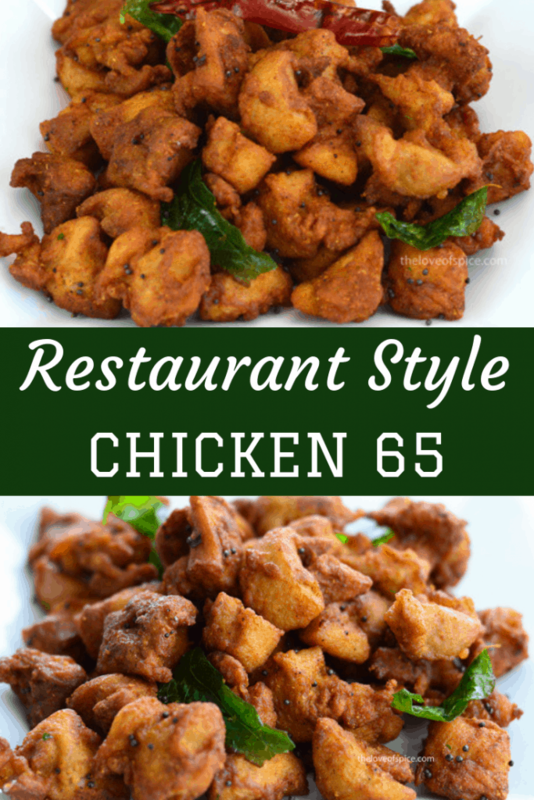 Chicken 65 is easily one of the more popular (Indian) chicken appetizers, because let’s face it, it’s one of the best things you can do with chicken. Okay fine, that’s debatable (especially for a chicken lover like me, but you get the point). That being said, there are many ways this dish can be made, with different cooking methods, flavor combinations, and even varying consistency (dry vs gravy). The Chicken 65 Recipe I am sharing today is a more traditionally spiced, deep-fried and dry version of the dish. It’s also the more popular version (not to mention the yummier one too). 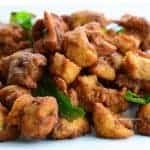 Chicken 65 (at its core) is a deep fried boneless chicken appetizer (or snack) which when spiced to perfection is a super delicious treat that will be the star of any event or party you make it for. But it’s really simple and easy to make, enough that you can choose to indulge in it any time you want. All you need to do is spice it right, and fry the chicken pieces till they develop a crunchy outer coating, while remaining juicy and delicious on the inside. Tempering is optional, but highly recommended. How did Chicken 65 get its name? When a dish has a name like this, and is so widely known (and loved), it’s obvious that people will be curious about the origin of the name. I was too. But when I did my “Google Research”, I came across several theories, ranging from slightly odd to kinda weird to absolutely absurd. Some said the 65 came from the chicken being exactly 65 days old, others said the name was derived from cutting the chicken into 65 pieces. Some even said it involved using exactly 65 ingredients (*shudders*). Honestly, as much as I love cooking, I am skeptical about ever making a dish that will require 65 ingredients. Thankfully this doesn’t. Anyway the most popular (and probable) theory is that this dish was simply the 65th dish on the Menu of a Military Canteen in Tamil Nadu (India), and was addressed by the number because of the language barrier faced by many military officers who came into this canteen from all over the country and could not read/speak Tamil well. Sometimes a little history is interesting, right? Now coming to this recipe – like I mentioned earlier, this is the dry version of Chicken 65. 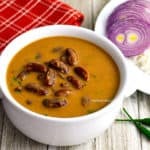 At some point I will share the gravy version as well, but for now I hope you try out this dry (yet delicious) version to share with your family and friends. Because whenever I have taken it to potlucks and parties, it’s been an instant hit with adults and kids alike. 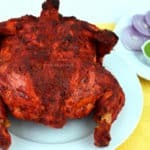 Oh and speaking of parties, if you are looking for a Chicken entree that will steal the show, you should try out my recipe of Whole Roast Tandoori Chicken. 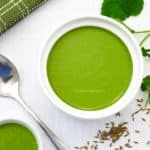 It can also be used as an alternative dish to Turkey on your Thanksgiving Table. Check out my detailed step by step recipe here. Looking for a Vegetarian Appetizer instead? 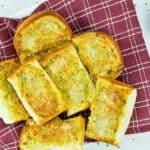 You cannot go wrong with a good Garlic Bread Recipe. Clean and cut the boneless chicken thighs into bite sized chunks. I cut into small cubes, but if you want to cut it any other way – that’s fine too. However do ensure to cut the chicken into (approximately) same sized pieces. It will make it easier to fry evenly. Also, I would highly recommend using thigh meat for this dish (or actually for any deep fried chicken dish) because it can sustain higher temperatures without drying out or becoming rubbery in texture. Once you have cut the chicken into bite sized chunks, it’s time to make the marinade. 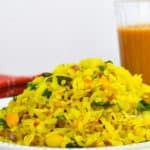 Beat 2 eggs, and add ginger garlic paste, and the spices listed in the ingredients (salt, chilli powder, coriander powder, cumin powder, garam masala powder) to it, and mix well. Now add this mix to the chicken pieces, mix well, and let it marinate for 4-6 hours in the fridge. Important Note: If you are pressed for time, a 2 hour marination is enough. But once you keep the chicken in the fridge, ensure to take it out, and thaw it for at-least 30 mins at room temperature, before you decide to fry it. Also remember to add in the corn flour (for binding) and rice flour (for a crispy coating) to the marinated chicken cubes and mix well, before frying. Technically, you can omit the corn flour, and go with 2 tbsp rice flour instead (for a really crispy chicken 65), especially if you are already using eggs, as it also works as a binding agent that will form a seal to lock in the juices and help the chicken stay deliciously tender. I personally prefer the texture that a mix of corn flour and rice flour leads to, so I go with that. But feel free to suit yourself. Heat the oil, and when it comes to temperature, add in the first lot of chicken cubes to fry. However, ensure that you do not add in a whole lot of chicken cubes all together in one lot. Because this will over-crowd the pot, and will bring down the temperature of oil, which will in turn result in chicken retaining some oil, and not getting the crisp coating which we love. 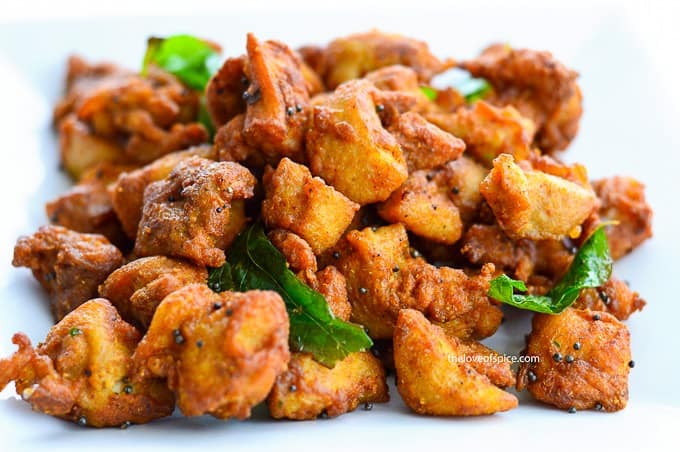 Once you have fried all the chicken cubes, it’s time for the final tadka or tempering. Technically, this step is optional, but HIGHLY RECOMMENDED. In a small tadka pan, heat up 1 tbsp oil, add in the mustard seeds, and wait till it starts popping. Once it does, add in the chopped curry leaves, and the slit red chillies, and let it fry till the curry leaves look well roasted. Saute the fried chicken cubes with the tadka for a couple of mins, and turn off the gas. The crispy crunchy deliciously spicy Chicken 65 is ready to serve! 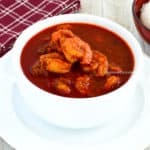 You can always add in red food coloring or even kashmiri chilli powder instead of regular chilli powder for getting that restaurant like red-colored chicken 65. I personally don’t add in food coloring if I can avoid it. The recipe looks super tasty. Bookmarking this to try later. Looks amazing! I’m going to try this out. I tried Chicken 65 for the first time in Bangalore. Have been in love with it ever since. Your recipe makes me feel hungry. Love how there are several versions to the moniker. Will try this in a vegetarian variant! Looks amazing. 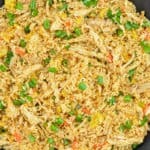 Interesting recipe, being a vegetarian, I will try with paneer instead of chicken. Haha, right? The name always had me curious too. Muy husband was asking me the other day a recipe for this. Thank you 😊 I now have one. I enjoyed reading about the history of the name. That was very interesting.